On the morning of December 20, 1954, navy Lt. (Jg.) George Delafield took off from Quonset Point Naval Air Station in Rhode Island in a Grumman AF-2W Guardian, (Bu. No. 124785), for what was to be an instrument training flight. 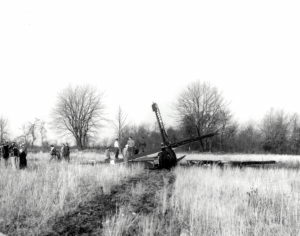 Shortly before 10 a.m., while over the town of Killingly, Connecticut, the aircraft’s generator stopped working resulting in an onboard fire. Lt. Delafield managed to set the plane down in an open field and climbed out as soon as it came to rest. He was uninjured, but the plane was a total loss. The aircraft was assigned to VS-39 at Quonset Point. 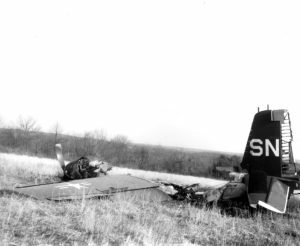 This accident is sometimes confused with another AF-2 Guardian that crashed in the neighboring town of Putnam, Connecticut, on May 7, 1953. In that instance four men were killed. The details of that accident can be found elsewhere on this website. In 1996, members of the Confederate Air Force Museum, (Today known as the Commemorative Air Force Museum) visited the site in hopes of recovering pieces of Lt. Delafield’s AF-2W to be used in a restoration project of another AF-2W in the museum’s collection. The Guardian aircraft in the museum’s collection was once flown by famous naval aviator Vice Admiral James B. Stockdale in the 1950s. During the Vietnam War, Stockdale flew 116 combat missions before being shot down and captured. He spent the next seven-and-a-half years as a POW, four of them in solitary confinement for organizing a resistance movement among the prisoners. For his efforts he was awarded the Medal of Honor. He was also Ross Perot’s running mate in the United States 1992 presidential campaign. Today the restored Guardian is in the Commemorative Air Force Museum’s collection as static display at their Arizona facility.